Far-reaching plans to link Bath with Bristol using a ‘high-frequency mass transit’ scheme are being drawn up to help ease the economic impact of traffic congestion on businesses across the West of England. The ambitious scheme, likely to be more than a decade away even if it gets the green light, would tie in with Bristol’s proposed mass transit scheme. That long-term project – which could include use of tunnels under the city centre – is favoured by Bristol’s elected mayor as a viable option for moving people around, in and out of the city. It would link the centre with its suburbs, with spurs going north and east, a separate one to Bath and one to Bristol Airport to the south-west via South Bristol. 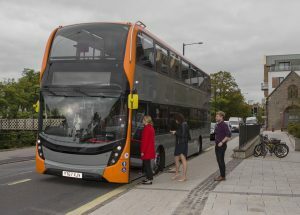 In the short term, the link to Bath would take the form of an extension of Bristol’s recently-opened £230m Metrobus network, pictured, which now consists of three limited-stop routes into the city centre. Most of this network uses existing roads, including their bus lanes, although some new roads and bridges were built to shorten the routes and avoid congested roads. No further details of the Bath link have been revealed and a meeting of the West of England Combined Authority (WECA) – which brings together the leaders of the area’s three local authorities, including Bath & North East Somerset (B&NES) – due to discuss funding for a study into it was cancelled this morning due to the snow. The committee was to be asked to agree to an initial £200,000 to further develop a ‘strategic outline business case’ using guidance from the Department for Transport. WECA said this would take between 18 months and two years and would look in more detail at the “demand, scope of project, and its potential outputs and benefits”. A more detailed study of transport requirements for Bath and the wider North East Somerset area is also included in the plans and would tie in with B&NES’ own Getting Around Bath transport strategy. WECA said its officers would work with those in B&NES to produce a new Transport Study for Bath to “address transport challenges and ensure alignment with the wider mass transit work”. This will be used to inform and update the Getting Around Bath transport strategy. A report to today’s meeting said: “There have been many previous studies and documents produced over the past 10-15 years which relate to transport (and related topic areas) in Bath. Hence understanding how current and previous work fits with the JLTP(Joint Local Transport Plan) and aspirations for mass transit is key to beginning to address the challenges in Bath. The Joint Local Transport Plan sets out the approach to the way transport will develop up to 2036 across the West of England. It considers a wide range of options which could support sustainable and greener travel including cycling, walking, bus, rail, mass and rapid transit, and electric/autonomous vehicles. The role of stronger public transport links in and around the region formed the basis of a major summit in Bristol last week where Business West, the organisation behind Bath Chamber of Commerce, revealed the results of a survey carried out specially for the event. Some 70% of the 140-plus businesses that responded to the survey said lateness was the key impact of congestion, while 15% said it impacted on recruitment and retention. Eighty per cent wanted better integration between transport modes and 60% said existing public transport links were not suitable for their businesses. James Durie of Business West said it was crucial that businesses across the region came together to speak with one voice on transport.